I'm on a bit of a health kick. It's not as easy for us Coeliacs to just pop down to the local lunch bar and grab a sandwich during our break. We have to be organised. Know who has gluten free options available - are the dressings on salads gluten free? Do you use sperate/clean cutting boards and knives? The list is endless, but, if you're organised you can save your hard earned cash AND have a delicious gluten free lunch! Wraps are such an easy lunch and there are so many possibilities - this week I've had left over roast lamb with roasted pumpkin and carrot with a little baby spinach and cheddar. Plus sandwich toasters at work are so easy to wipe down and toast your gluten free wrap in for a warmer winter lunch.With endless filling possibilities and the ease of filling and wrapping in the mornings make them a great healthy gluten free lunchtime option. Plus looking just like 'normal' wraps they're great for the kids lunchboxes! Mayonnaise - check it's gluten free! 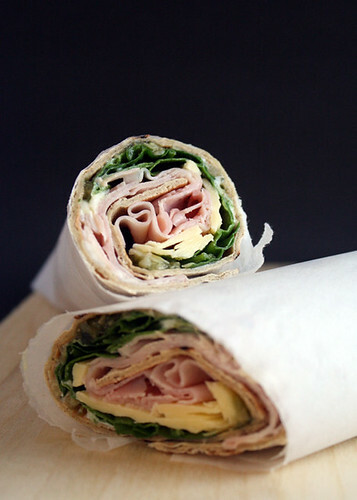 Spread a dollop of the pesto and mayonnaise onto your wrap. 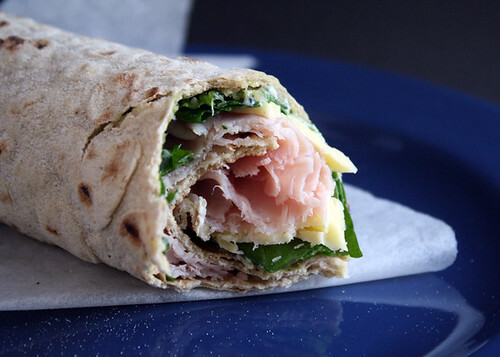 Top with a large handful of spinach, some shaved ham and cheese. Season with salt and pepper as desired. Note: If your wraps aren't very soft, you can soften them up using the following technique. Heat a large frypan. Once warm add a tablespoon of warm water and swish around the pan, if it evaporates before adding the wrap then add a little more. Add the wrap and cover with lid for 30seconds or so. Remove wrap and use immediately.